Around 15:30 we recieved the call from the police about 2 walkers crag bound at the top of the gully on Sail Mor on Beinn Eighe, Arjan asked forchopper which was due at 17:00, and myself and Seamus to be on standby in the glen with Arjan in the Landy. Weather was good at the time and cloud nice and high so we anticipated chopper extraction and we even booked a table for 6pm at the Kinlichewe hotel. Chopper on scene decided they needed us to be lifted to get the casualties. Due to the high turbulence on the ridge, we headed back to base for technical kit and ropes. Arjan called out more team. Once on board we had quite a bumpy flight up Arjan up front with crew planning the rescue. Myself and Seamus were cattle class up the back. Soon in to the flight it was rather bumpy with bad turbulence, Seamus got out a sick bag. They could not drop us on Sail Mor so instead dropped us and the 500ft rope on Coineach Mhor. Not ideal as winds were about 80mph giving a very interesting winch down which was captured on the GoPro. We also we had the “Bad Step” to contend with in the dark. Chopper departed for fuel so we proceeded to the “Bad Step”. This time the wind was gusting 90- 100mph. We could hardly move, thrown across the hill a few times so then Arjan decided to pull the pin and get off the hill and do rescue in the morning. A call was put in to retrieve us by helicopter. Fair play to crew they did try but the thing was howling and screaming above us and being thrown all over the place. After our interesting journey and winch out we were all a wee bit concerned about our next flight. Moments later 951 got out quick and headed home as uplift was impossible. Their parting words were, “we can’t get you, hunker down for the night and good luck”. Andrew informed casualties they were not going to be rescued that night. It would have been madness for us to stay up there. We crawled on our hands and knees along the ridge and on our fronts at times till it was safe to descend in to Corrie Dubh. We then hit the screen shoot and headed down. Tom was in the glen with the van and lights going which was a great help. Boy were we glad to see him and head back to base for some rest and round 2 the next day. blow something perhaps in the engine. I’m no expert but one would say that doesn’t sound good. All in all an interesting evening! A top decision made to pull out and go the next day. We are all safe and so are the casualties. Big massive effort put in by Torridon MRT, RAF MRT and R951 and R948. On the Tuesday night, we arranged for R951 to be at Torridon base at 08:15 and also asked for RAF back up in case we needed help with a stretcher evacuation. The team were asked to muster at Torridon YH at 07:30. We had asked the casualties only to turn on their phone at pre arranged times (09:15, 0000, 03 00, 06 00 ) so that they we could talk to them but they would save battery. From our conversations with them, we knew they were OK but very scared. We impressed on them the importance of staying where they were. 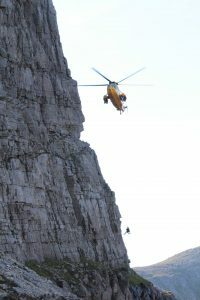 The female casualty wanted to try to make it out of the top of the gully. It is my belief that they were in the best possible place to see out the storm and that if they had tried to move the would have died. On Wednesday morning the road at Garve was blocked by a landslide so the first job was to get information to the RAF team (travelling from Kyle) about Gordy’s back route bypassing the blockage. I asked the police to do this. At Torridon YH: Mark, Arjan, Ryan, Andrew, Rod, Graham, Gordy, Alasdair, Tom, John. The 17 RAF MRT arrived at about 08:30. R951 flew over Sail Mhor to make an assessment but weather conditions prevented them completing the operation. They arrived at the YH at about 09:15. First team dropped below Coire Mhic Fhearcair: Gordy, Mark, Rod, Graham. Second team: Andrew, Alasdair, Tom, John + 2 RAF. R951 then returned to Inverness as conditions made flying too dangerous. R951 and 952 were later tasked to a kayaking incident in Ballater so were unavailable for the rest of the day. The grid ref we had put the casualties at the top of the big gully you see approaching Sail Mhor. Gordy’s team approached from a gully on the leftmy team approached from directly underneath. We made considerable efforts to maintain communications between both teams, which was a bit of a faff but important. Mark and Gordy spotted the casualties and made their way to them,with Rod and Graham following. Tom and John approached from directly underneath, scoping out the descent possibilities of the gully our team were in. I took up position about half way up the gully with two RAF MRT and Alasdair. We took care to position ourselves out of the line of inevitable falling rocks. The gully was extremely loose and it would have been a mistake to have too may people too high up around the casualties. Encouragingly, when we did dislodge television sized blocks, the gully was easy angled enough so that they didn’t fall too far and there were plenty of mobile small rocks to absorb the impact. The casualties were mobile. They were fitted with harnesses and helmets and we used a mixture of short roping and rope hand rails on steeper sections to bring them down and out of the gully. It took about 2 hours from when we got them moving to exiting the gully. Below, Ryan was with the remainder of RAF personnel. He had worries about river levels at the stepping stones so Tom , Ryan, an RAF team member and I went ahead to check, but things were OK. R948 was able to evacuate the casualties (by this time, moving very slowly) from near the junction with the Coire Mhic Nobuill path. I think everyone was off the hill by 16:30. So, that’s it. Two young people still around to have a Happy New Year because of Torridon MRT, the RAF and the coastguard helicopters. Congratulations to all involved in the rescue. Conditions must have been atrocious up there on Coinneach Mhor on Tuesday afternoon. Or visit our support page to find out how you can help.